All the yummiest Starbucks-esque flavours – masala chai latte and pumpkin spice combine to form delicious granola bars by The Nibble Box. The deets follow below. We’re professional snackers, we are. When the clock strikes the ungodly hour of four, our noses sniff out and hunt any morsel of food in the office. Put a halt to this desperation, we say. Get some snacks from The Nibble Box – saviours to the calls of hunger. 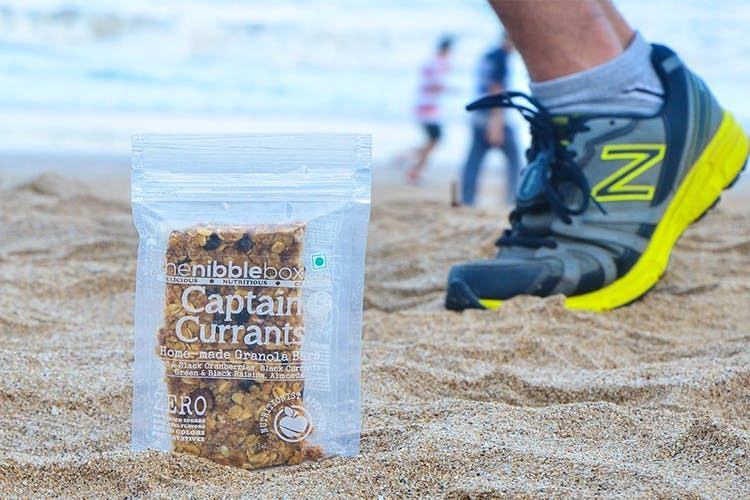 They make nibbles of all kind: breakfast granola jars, granola bars, lots of combos of trail mixes, and individual ingredients such as black currants, apricots, and more. Our pick from the list is their selection of granola bars which are reasonably priced at INR 100 each and come in an interesting variety of flavours – pumpkin spice latte, masala chai latte, java chip latte It’s like a coffee in a bar. Check them out here. Add these to your cart and whip them out whenever you need to calm the rumbles.